The Pink Meepit is the Meepit that most Meepit owners have. These Meepits are in the standard color so they have a normal level of mind control. If you make eye contact with one, you will be under its control and will be forced to buy expensive battle equipment for it. If you have a Meepit, it is important that you never make eye contact and to get rid of it before it tries to control you. The Grey Meepit is one of the most friendly Meepits. The reason it doesn't have the lowest danger level is because they have a terrible power. This Meepit is so sad that it can affect pets around it. It can turn the happiest pet in all of Neopia into a pet that is always miserable. This Meepit's chances of trying to control people is slim because it doesn't practice very often. This pet is safe to keep around your pet if your pet was recently painted grey. The Dung Meepit is a pet that you don't see very often. That doesn't change the fact that this pet is dangerous. Like the Grey Meepit, the Dung Meepit isn't very good at mind control. This is because it isn't very cute. While it lacks mind control, it does have other kinds of power. This pet is so stinky that most neopets will pass out if they get a whiff of its stench. This give the petpet power to go anywhere it wants to. This petpet also has the power to blend in to piles of dung so it could be anywhere that has dung. This makes this pet a dangerous advantage to pet owners that collect dung. The Snow Meepit is a pet you can most likely find in Terror Mountain. This petpet is very good at using its cuteness to control pets. 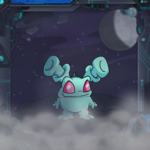 If you get controlled by this petpet, you will most likely make you buy snow food and snow themed weapons. Like the Dung Meepit, this petpet can blend into snow and can fool pets into thinking that it is just a snow petpet someone made out of snow. This makes it very dangerous to those unprepared for a Meepit attack. Its only weakness is heat; it cannot take the sun's heat for very long. It's a dark and stormy night. You hear a knock at the door. You open it, but nothing is there. You turn. There's a Starry Meepit taking your all of your pet's Battledome weapons. It jumps out the window. Starry Meepits are unlike any other meepit you will meet. First, Starry Meepits only use their mind powers to control flying, starry neopets. Second, they only come out at night. They can camouflage themselves to look like the night sky. Last, they use the flying neopets they control to break into pet owner's neohomes and steal their weapons. They are not seen often, but they are still very dangerous. Fire Meepits are highly populated in Moltara. They do not have very strong mind control powers, but they are very strong petpet. They work in blacksmith shops. They forge armor and other weapons for their owners to sell. Do you think they make good pets? You are wrong! If you get a Fire Meepit mad, they go into an uncontrollable rage. These pets can control fire so you really do not want to be around it when they're mad. Like the Fire Meepits, Robot Meepits live in Moltara. They cannot control pets, because the noise the petpets make from their metal insides interrupts the mind control process. Even though they can't control pets, they did get Tangor to build them some weapons. We have interviewed him many times, but he claims to have no memory of it. We have no further evidence about this incident, but Robot Meepits should be avoided at all costs. Pirate Meepits have been spotted mostly on Krawk Island. These petpets have been known to capture pirate's ships. They are known to take natives' dubloons and to make neopets help them on their stolen ships. Pirate Meepits are also known sword fighters and can beat anyone in a battle. This makes them one of the worst Meepits to run into while on the high seas. This rough and tough Meepit is found mostly in Tyrannia. This petpet is one of the strongest petpets you will ever meet. They spend their time crashing rocks and throwing dung at passing pets. These pets have a coat of fur that is always stinky and matted with dung. These petpets are not the brightest petpets in Neopia. They sometimes mistake other pets for rocks. They also have a fiery temper so it's best to stay away from them. Finally, the most dangerous Meepit known to Neopia is... the Mutant Meepit. These petpets are scaly things with long claws for toes and fingers. Despite their appearance, they have the most powerful mind control ability. They can summon mutants from every corner of Neopia with one cry. They spend most of their time at the Haunted Fairground. They tear up Robot Chia Clowns, and they steal prizes from the booths. They love spooky food. Most of the time, they can get it for free because they are so terrible. Just remember, stay away from this one. It is not safe for neopets that are not Mutants. Now that you have experienced some of Neopia's worst petpets, do everything you can to be safe. Take extra precautions, keep all your valuables locked up, and be ready to defend yourself. You never know who or what might be out there. That friend, that perfect Petpet, was nowhere, gone from Neopia. Invader wondered if there was even such a thing. Trinian shouted, "Any sign of the shadows?" Bea commented, "I'm pretty sure they're back there pointing and laughing." How Roxton Colchester the Third came to be the infamous explorer that he is today.